Courtesy of Pacific Sotheby’s Int’l Realty, Ashley Hyde. Resort-style oasis in Kite Hill. This meticulously upgraded 4 bedroom 3 bath home sits on a quiet cul-de-sac in one of Laguna Niguel 8217;s most coveted communities. This property brings the private resort-style entertainment vibes right to your backyard. 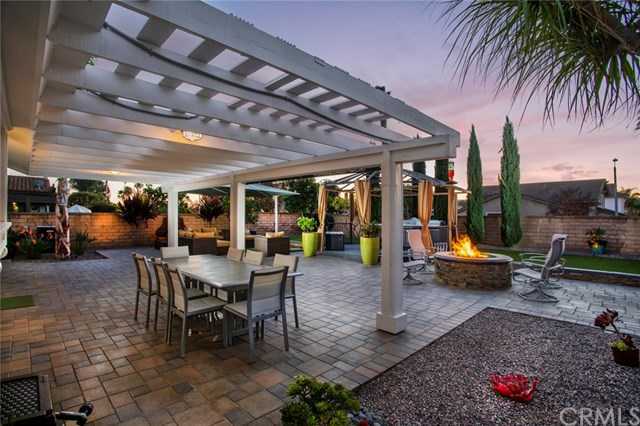 Your family and guests can enjoy a variety of features this backyard boasts, including a Caldera spa, shaded outdoor living space, mounted outdoor television, and gas firepit. All set in a surrounding of tranquil water features, a variety of fruit trees and cacti, and thoughtfully designed landscaping. The interior of the home is masterfully designed with an extensive list of custom upgrades in each room. Details such as beadboard paneling, crown molding, on-trend light fixtures, and lavishly upgraded bathrooms make this home both turnkey and alluring. The newly-upgraded master bedroom and ensuite feature over $50,000 in upgrades including new hardwood flooring, a hearth, Italian and Spanish imported bathroom finishes, large walk-in shower, new standalone tub, and cedar-lined walk-in closet. The 3-car garage provides ample storage space and welcomes you at the end of an Italian stone driveway. Additional Kite Hill amenities include sprawling green parks, playgrounds, lap pools, basketball, sand volleyball, and tennis courts. Located 10 minutes from Laguna Beach, close to stores, restaurants, shopping, and freeways, this home really is the full package. Please, send me more information on this property: MLS# OC19027346 – $1,199,900 – 29151 Murre Lane, Laguna Niguel, CA 92677. I would like to schedule a showing appointment for this property: MLS# OC19027346 – $1,199,900 – 29151 Murre Lane, Laguna Niguel, CA 92677.